Wherever life is, you will most likely find water or some other liquid. This is a continuation of a series of posts. Each is designed to be understandable without reading the others; they do build off each other, however, so check them out starting with Part I. In the last post on this topic, I hope I got across how little we know of life’s beginnings. This planet we live on hosts the only life we know of thus far…in the whole universe! Does that mean we are most likely alone? Not really. This and the next post will look at the possibilities for life elsewhere. Water is a good thing for life, but energy is also necessary; here in the form of geothermal heat in Yellowstone National Park. It must be said that our ignorance of what the universe offers in terms of life beyond our solar system is profound. Actually, I should not be so negative, because over the past decade or so we have found out much more about our universe’s capability to host life than we knew before. This new knowledge has come in the form of the discovery of planets orbiting other star systems, along with the discovery of microscopic life in places we never thought could host life. There is something I should mention before going further. Scientists who study this sort of thing, called astrobiologists, do not expect to find any living thing out there that is visible without the aid of a microscope. That’s because the conditions that are favorable for microscopic life (bacteria, etc.) are much broader in scope than those favorable for multi-cellular (big) life. In addition, more complex life requires a much longer period of time before it can take hold, as opposed to the shorter time required for simple one-celled life to evolve. But one thing is for certain: once we find microscopic life anywhere outside Earth, the stage is set for discovering much more complex forms. Symmetry in nature comes in all shapes and sizes. Humans have been probing the planets we share this sun with for a number of years now. The first exploration outside of Earth orbit happened in 1962, when Mariner 2 flew close to the thick, acid-laced cloud-tops of Venus. Then came the Apollo era, when the United States sent astronauts to the Moon and Russia managed to land a few craft on hostile Venus. We also probed Mercury with a later Mariner mission. The twin Voyager probes, launched in the late 1970s, were our first foray to the outer planets. 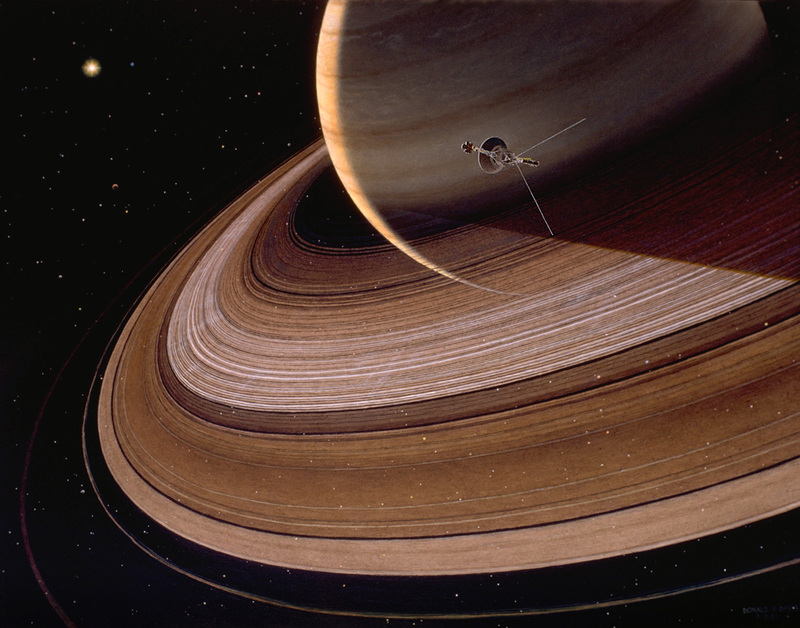 Voyager 1 showed us incredibly detailed close-up views of the gas giants Jupiter and Saturn. Voyager 2 flew by Uranus and Neptune as well (still the only time we’ve visited those distant planets). I recall seeing those first images of Jupiter’s clouds and Saturn’s rings in detail. I was in High School, and the details were was truly blown away. And I wasn’t the only one. I normally only use my own images in this blog, but this painting is so realistic I couldn’t resist. Click image to go to source page. The Voyager probes are now the furthest from home that anything made by humans has ever traveled, and they win this honor by a mile! Both are well over 100 times as far from the Earth as we are from the Sun. They are also traveling by far faster than anything humans have ever built. Soon Voyager 1 will arrive at the Heliopause, which is the spherical boundary around our Sun where the solar wind ceases to be the major influence, and instead galactic forces take hold. In other words, our little travelers are about to leave our star’s neighborhood and forge a path out to the great beyond, the Milky Way Galaxy. The U.S. has been the de facto explorer of the Moon and Mars, along with the outer planets, while the Russians picked the most hostile rocky planet on which to land a probe – Venus. The European Space Agency has also been active more recently, designing the probe that landed on Saturn’s moon Titan. While Mars garners the most attention, with its rovers and orbiting observatory, two U.S. probes are busy elsewhere. Messenger is finishing up its mission at Mercury and Cassini continues to orbit Saturn and its zoo of moons. 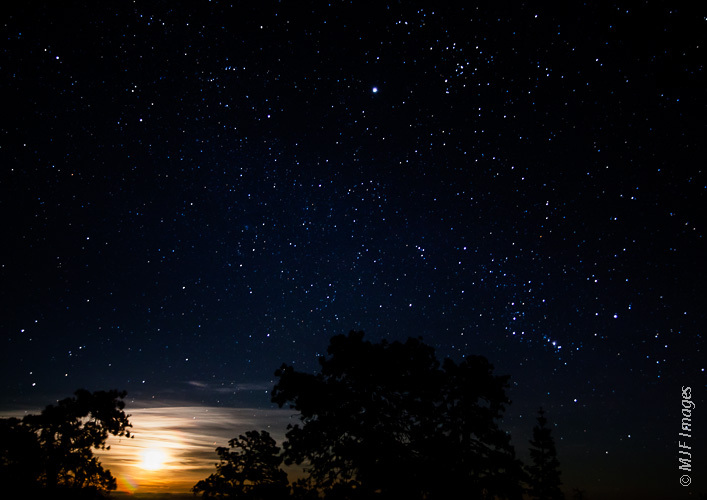 The full moon rises on the North Rim of Grand Canyon, as Orion, Jupiter and company shine above. In the 1970s we landed for the first time on Mars. The lander was called Viking. Along with incredible photography, the non-mobile lander dug up a small sample of soil and analyzed it for life. Although it looked initially like the results might turn out positive, the soil was found to be completely hostile to life. Since then, a series of Martian orbiters and rovers have found abundant evidence of water on Mars. The only problem? This water appears to have last flowed billions of years ago. (Intriguingly, there is some evidence of periodic eruptions of liquid water from below ground, even recently.) We have yet to find fossil evidence of past life on Mars, and the planet’s current condition appears to be as hostile to life as we ever thought. An eclipse of the sun is one of the more humbling natural spectacles. Since both Venus and Mercury are much too hot to hold liquid water, even in the distant past, the next good place (beyond Mars) to look for life are the many moons of Jupiter and Saturn. Europa, one of Jupiter’s moons, has been known for years to have a liquid ocean beneath a thick ice cap. The moon is heated by enormous tidal forces created by the nearby gas giant, so this probably means that hot vents discharge into the sea. On Earth, undersea hot springs host entire ecoysystems, so it stands to reason that Europa could hide similarly-powered concentrations of life clustered around hot vents beneath its ice cap. Also, Enceladus, a moon of Saturn that also has a subsurface ocean, represents an excellent habitat for life. Mount Rainier and the night sky above Eunice Lake. Although other moons around Jupiter and Saturn are thought to contain liquid or partly liquid interiors, arguably the most intriguing place to search for life is Titan. Titan, orbiting Saturn, is the Solar System’s second largest moon. It’s larger than Mercury and not much smaller than Mars. There is a lot of methane on Titan, much of it liquid because of the frigid temperatures. In fact, methane on Titan might serve the same role as water does on Earth. We have observed features like river valleys and lakes on Titan, but instead of being filled with water they are filled with liquid methane. The relative sizes of Earth, Mars and selected moons in the solar system. Click on image to go to website where the author of this image, Abel Mendez, is sourced. Why is this interesting for life? Because prior to the emergence of oxygen, Earth was a planet rich in methane as well. Early life on Earth relied on methane not oxygen, and in fact, these organisms are still around. There is an enormous community of micro-organisms (methanogens) living just beneath the sea floor today. In fact the methane they produce has been stored in ice formations that could, because of global warming, erupt and release into the atmosphere, greatly accelerating global warming. Many scientists think Titan could be revealed to operate much as Earth did billions of years ago, with microscopic life very similar to those early Earth days. The fact is, although we have made great strides in understanding how likely it is to find life within this solar system of ours, we are just now scratching the surface. Life on Mars has by no means been ruled out, and the moons of the outer solar system are just now being examined. It will take a very sophisticated effort to look for life in Europa’s subterranean ocean, or across the huge and distant moon Titan, or on Enceladus. But even the discovery of a community of extremophiles (micro-organisms adapted to extreme environments) on one of these relatively nearby bodies would be a watershed moment. It would tell us that we are not alone in our neighborhood, and that life has likely gotten started in countless locations across the universe. Next up: the incredibly diverse zoo of planets orbiting other stars. Evening falls on the Columbia River, where two explorers passed on their way to discovery. It’s now quiet, and the frontier has moved on. Mount Hood is illuminated by a half-moon with the summer stars above. How did all of this come to be? I mean everything around us. Have you looked out into a deep inky-starry sky lately? Have you tried, actually tried, to comprehend the distances involved, the multitude of galaxies and star systems? Two things have become obvious: (1) a multitude of planets exist, many likely to host life; and (2) the universe, in the way it works, is fine-tuned to be friendly towards the emergence of life. This leads many to the idea that life might not be just an accident. In thinking about the universe’s ultimate origins, life just might be the one small feature of the universe that is too important to ignore. To date, physicists have been in charge of figuring out the origin and make-up of the universe. If you knew any physicists in college, or even since then (highly unlikely), you know how ridiculous that notion is. Unless the universe is nearly devoid of life, an assumption that is becoming more and more unlikely as time goes on, then we need more than just quantum physicists to answer the ultimate questions. To begin with, think of it this way. Our universe is just under 14 billion years old. That is the quite precisely dated age of the Big Bang. There is a small chance that this age is in error, but I wouldn’t hold out much hope that the error is 14 billion minus 6000 years! The universe (and Earth) are ancient, incredibly ancient. A lot has taken place already. But there is much much more to come. All evidence points to this thing going on for a long time to come. Where are we headed? That is a question just as important as the origin question, and its answer could help shed light on why we are here. Pondering one of Earth’s possible cradles for life, at Yellowstone’s Grand Prismatic Spring. It’s obvious now that our universe began with a great explosion of space-time itself (the Big Bang) and has been expanding ever since. The rate of the expansion has apparently not been constant. It has been speeding up of late, or that is the current best explanation for astronomical observations of stellar explosions in deep space. I’m taking as a given that we MUST eventually discover how all of this came to be, where it is going, how it will end, and (most importantly) why. At least we must continue to try. Those who put their faith in God, in the Bible, the Koran or Book of Mormon, even these people will be enriched if and when we discover the true nature of things. They might not admit it publicly, but they will be enriched along with the rest of us. The crescent moon rises in the early morning of Friday the 13th, 2012. There is nothing in astronomy thus far that contradicts the idea of a creator. We are having some trouble describing the situation at the precise moment of the Big Bang (we can only describe events AFTER the Big Bang). But even if we do, hints of higher levels of reality, a Multiverse (see below) means it all could have been set in motion by a creator long before “our” big bang. Now be honest. When you read the word “creator”, you had in mind an image. I’m guessing it was an image derived from childhood religious teachings. But notice I didn’t capitalize the word. That’s because a creator, which let’s be honest is not at all required for this universe to have come into being, could indeed be someone entirely different than our traditional image of God. Little worlds in water droplets at Portland’s Rose Garden on a rainy day. If you know something about quantum theory, you might have heard of virtual particles. These are actually physical phenomena that pop into being from nothing, and then pop right back out of existence. In fact, some scientists believe that the universe is speeding up its expansion because of the energy coming from this “restlessness” in the vacuum of space. If you are willing to skip a lot of quantum physics and general cosmology in between, you can move to the extreme case of a universe popping into being from nothing. In other words, you may be part of a universe that came into existence from nothing, with no help from anything but the inherent instability of truly empty space. No creator, or Creator, is required. The basic problem with applying quantum theory to the universe as a whole is, as it has been for closing on a hundred years now, the difficulty physicists have in applying quantum theory to the world we live in. The word quantum refers to things so tiny that they’re really little packets of energy rather than things with length and breadth. Electrons and protons are two examples of quanta. These are things we will probably never photograph directly (atoms, made up of protons and electrons, have been photographed). The Milky Way soars over Crater Lake, Oregon. It shouldn’t surprise anyone that we haven’t had much luck so far taking a theory that describes the world of electrons and protons and applying it to things that are infinitely more huge like a person, let alone something as vast as a universe. Things like rivers and rocks, elephants and planets, stars and nebulae are, in essence, emergent properties of some underlying reality. We seem to be stumbling around, using the language of mathematics to look for this underlying reality, and coming up with plenty of possibilities. All the while physicists have not been able to connect any of the myriad possibilities to what has actually emerged from that reality. A rare solar corona appears. Einstein, Bohr, Wheeler, Feynman, etc., etc., all very smart scientists, have put forth ideas that would extend classical quantum mechanics. But nobody has succeeded in coming up with a well-tested quantum theory of the macroscopic world (a.k.a. quantum theory of gravity). There are theories in science, and then there are Theories. Sometimes, when it is pure mathematics behind the idea, they call it a theorem. Nobody would call relativity, or evolution by natural selection, a theorem, believe me. This ongoing effort is often called the Quest for the Holy Grail of Physics. So I’ll leave it there for now. I won’t say much more about quantum theory per se, though everything from here on out traces back to it. Instead I’ll jump right on to the idea of multiple universes, or the Multiverse, and how life and the origin of life might fit in. It would be good for anyone interested in science to get up to speed (layperson’s speed that is) on quantum theory. I don’t pretend to understand a lick of the mathematics behind it, so don’t ask me too many questions. But the ideas of entanglement and decoherence, of multiple histories, and even wave function collapse, are all good targets for a bit of googling and (better) actual book-reading. More to come. A small stupa in Nepal’s Himalayan mountains allows Buddhists and non-Buddhists alike a moment of rest and reflection on the trekking trail.